Managing a successful business requires not only the ability to sell a product or service, but also the ability to properly manage your accounting and the overall finances of the entity itself. When you need to keep better track of your income, expenses and even payroll details, choosing the right small business accounting software is necessary. Using the right small business accounting program can mean the difference between managing your finances with ease and having to manually keep track of all expenses, incoming revenue and taxes on your own. Finding the right small business accounting software requires you to know the type of needs you have when it comes to ensuring you are properly keeping track of your finances. Small business accounting software offers a wide range of features and capabilities, so whether you plan to track payroll taxes or simply the income you generate from making sales, it is important to know what it is you need before you begin comparing your options. Consider the business industry you represent and the requirements necessary in order to keep your company operations running smoothly. Because each business industry is different and may require more or less taxes to be filed, this is an extremely important consideration to factor in before shopping around for the right small business accounting software. 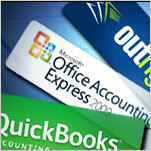 Pricing may also be an important factor to consider when you are shopping around for the right accounting software. Some accounting software programs allow you to purchase the program with a one-time fee, whereas other accounting software options are based online and may require a monthly, semi-annual or annual fee to get started and to keep using the services. Compare pricing, features and program capabilities to gain insight into the best type of software that is right for you and the business you are running. Search for small business accounting software that meets your needs when it comes to the features you require within the program itself. Whether you need assistance with budgeting, estimations of taxes or handling payroll all accounting software is different. If you want to manage customer contact information, track sales or even monitor the inventory you have left to sell for any period of time, knowing the features that are necessary will help you to eliminate additional business accounting programs that are not meeting your needs. Always read real reviews and testimonials of all business accounting software available before making a decision. Reading real reviews from customers is a way to determine which program offers the most features at the best price. Choosing the right small business accounting software can help to drastically reduce the amount of manual labor and work that is necessary in order to ensure your business is accounted for and being properly managed. Finding the right software can be done with a bit of research and knowledge of what it is you need to track and monitor.